Arrive in Budapest, the capital city of Hungary. Board your ship, settle in, and meet your fellow travellers. Home to several UNESCO World Heritage Sites, including the Buda Castle quarter in Castle Hill and Heroes’ Square, Budapest offers an unmatched combination of culture and tradition. Your city tour begins with a visit to the vibrant Great Market Hall. The remainder of this tour takes you to both the Buda (hilly) and the Pest (flat) sides of the river. Afterwards, visit Vörösmarty Square, the oldest and the most spectacular of all the Christmas Markets in Budapest. The “City of Waltzes” offers a treasure trove of gems just waiting to be discovered. Join a tour showcasing its regal splendours, such as the majestic Opera House and the former Imperial Palace of the Habsburgs before concluding in Vienna’s historic city centre. Afterwards, visit the Rathaus (Town Hall) Christmas Market. If you prefer a more active adventure, then join a guided bike ride to Klosterneuburg Abbey. During the afternoon, visit the Schönbrunn Palace with a giant sparkling Christmas tree. This market offers a stellar Christmas experience. 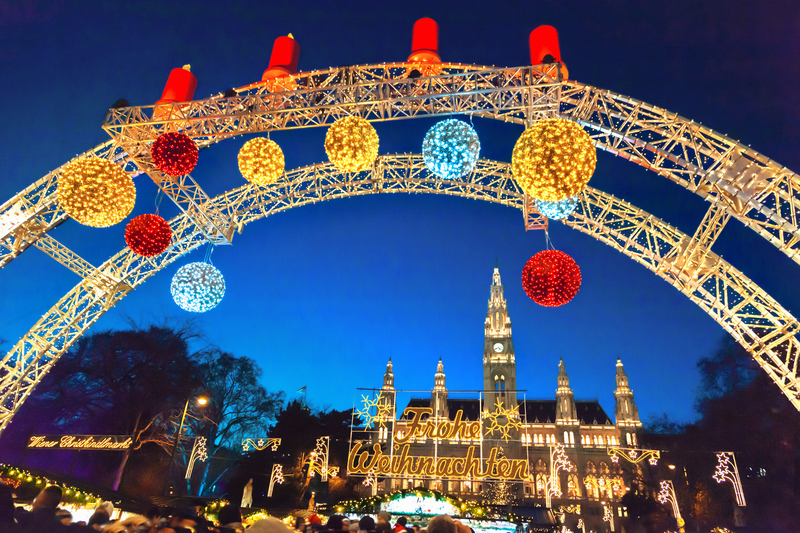 Cap the day off with “Vienna by Night” Christmas Markets at the beautifully decorated Maria-Theresien-Platz Christmas Market, set amongst the world-renowned sights of Vienna’s majestic Ringstrasse, and at the illuminated Rathaus, Vienna’s largest Christmas Market. High on a rocky outcrop lies the Melk Abbey, one of Europe’s most revered Baroque monasteries. Visit this magnificent Benedictine Abbey, which now houses a museum chronicling its history and a famous library with countless medieval manuscripts. Alternatively, go on a guided bike ride around Melk. Join a walking tour of the 2,000-year-old city of Passau, noted for its Gothic and Italian Baroque architecture and St. Stephen’s Cathedral. Go in search of Bavarian-style crafts at the Christmas Market. Alternatively, you can travel through the serene Austrian Alps to Salzburg, birthplace of Mozart. Your full-day excursion in Salzburg includes a walking tour of the UNESCO-designated Old Town, its magnificent cathedral and its Christmas Markets, including the Hellbrunn Palace, where its inner courtyard is turned into a romantic backdrop for one of the most beautiful Christmas Markets in Austria. You could also cycle along the Danube with a guide. Regensburg is one of Germany’s best-preserved medieval cities, as well as a UNESCO World Heritage Site. Join a guided walking tour showcasing the city’s architectural highlights, including the Old Town Hall and the Porta Praetoria, before visiting the Old Town Christmas Market. You could also sample some of Bavaria’s specialties—beer, sausage and pretzels. Or bike to the base of Walhalla where there is a neoclassical white marble temple inspired by the Parthenon in Athens. Later in the day, you’ll be treated to one of Bavaria’s most beautiful and romantic Christmas Markets at Thurn and Taxis, where you can watch artisans make their unique arts and crafts. Enjoy a scenic morning cruise as the ship crosses the Continental Divide via the Main-Danube Canal to Nuremberg. Join a city tour of WWII highlights and then walk through Nuremberg’s cobblestone streets to the Imperial Castle and 900-year-old city ramparts. Alternatively, you can taste your way through the city with a Franconian specialties tour, which introduces you to bratwurst, rotbier (red beer) and lebkuchen (gingerbread). Later, visit Nuremberg’s Christkindlesmarkt, one of the world’s largest and most famous Christmas Markets. Disembark the ship and say farewell to your companions as you take home warm memories (and lots of special gifts) from the Christmas markets of Europe. Arrive in Budapest and settle into your hotel. Budapest is one of Europe’s most regal and storied cities—and many of its most iconic sights can be seen right off the banks of the Danube. Today’s tour takes you to another side of Budapest to the Jewish Quarter, where there are some real treasures. The Great Synagogue, the largest synagogue in Europe and the second largest in the world, located on Dohány Street, represents the beating heart of this quarter. Other prominent attractions include the Holocaust Memorial, a weeping willow tree with the names of Hungarian victims during the Holocaust inscribed on each leaf; and the Shoes on the Danube, a memorial to the Budapest Jewish community. Check out of your hotel to board your ship. During the evening, be treated to an illuminations cruise around Budapest’s famed Parliament building as the city virtually glitters at night. Disembark the ship in Nuremberg and board a motorcoach to Prague. En route, enjoy some more time exploring another one of Nuremberg’s colourful Christmas Markets. Later, take a scenic drive through the Bohemian countryside as you transfer to Prague, and check into your hotel. The fairytale city of Prague always enchants, but it sparkles even more during the holiday season. Prague offers a collection of Art Nouveau, Baroque, Renaissance and Gothic architecture, which you’ll get to see on your tour. See Rudolfinum, the National Museum and Wenceslas Square, as well as visit 1,000-year-old Prague Castle and St. Vitus before walking over the romantic Charles Bridge to the Old Market Square, where you will find the capital’s famous Astronomical Clock, Tyn Church and the statue of Jan Husek. You will then have free time to explore Prague’s renowned Christmas Markets in the Old Town Square. Beer has a long and illustrious history in the Czech Republic, with the first brewery established in 993. Beer is a core part of the country’s national identity, so join a Czech beer tasting and discover for yourself what makes Czech beer some of the very best in the world. Bid farewell to Prague as you depart on your flight home.